Our culture celebrates big dreams. We are told to shoot for the moon, swing for the fences and climb tall mountains. We marvel at those who make it big – goals fulfilled. We encourage the ones who have stumbled along the way. I’m no different. In my last post, I shared my desire to dream impossible dreams (inspired by Gareth Pon). Count me in that culture. But I’ve noticed something. We’re never told how. We’re not taught to how to dream. Even more important, we’re not taught what to do when we have it. Lately, I’ve been feeling my way through the dark with this question in mind. What do I do with a dream? This year, I read the construction story of the original temple in Israel. It was built thousands of years ago by Solomon, son of David – greatest king in Israel. David defeated the giant Goliath, led thousands into battle as general, crowned king and took control of the known world. That wasn’t his impossible dream. David’s ultimate desire was building a temple worthy of being called the home of the God of gods. Until then, God’s “house” was a tent built hundreds of years earlier. David thought God worthy of a glorious permanent home. Each of us has a dream – something unique to you. God chose these dreams specifically for you. In some cases it is for you individually. At other times it is a corporate dream – business, organization, church, group, team, etc. 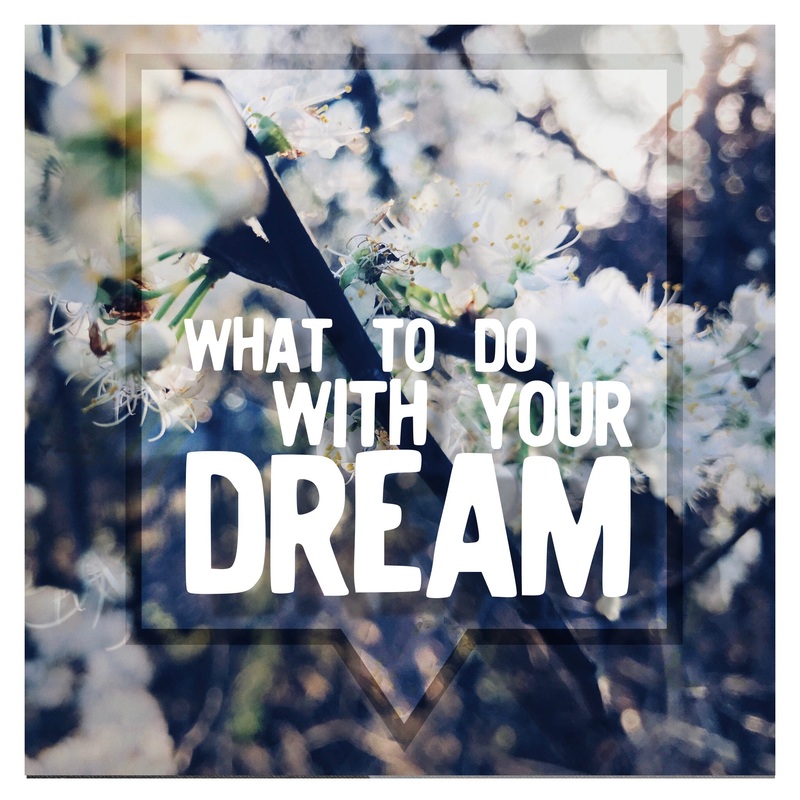 I’m still feeling out what all that means, but here are 5 things I’ve learned to do with my dreams. God is telling a story…His story, and God grafts our stories into His own. Because of His determination to use our stories, God redeems them first. Solomon’s story was a mess. He was born into what began as an adulteress relationship. Solomon’s mother was the infamous Bathsheba. She slept with David while both were married to others. David had her husband killed to hide her pregnancy (not Solomon, but a older brother who died at birth). God redeemed that story. He used it for His glory. God wants the same for you. Don’t discount your dream because of your mess – present or past. All great stories come from broken places – then God redeems them. Begin by knowing God will redeem your story and dream. Will you allow God to redeem your story and dream? Solomon adopted David’s dream as his own. He took it serious. He immediately went to work on this project – which took years. He planned, strategized and dreamed some more. The one thing Solomon never did was blow it off. It’s so easy to blow off a dream or idea (especially when it’s not yours to begin with). It’s too big, crazy, weird, hard. Don’t blow it off! Attack the dream God has given you. Plan. Think. Strategize. Do everything you know to do with the dream God has placed on your heart. Are you taking your dream serious? It took seven years to build the temple (and another 13 to build his own home). During those years, I’m sure people questioned Solomon about the details. Why this? Why that? The details were specific and minute. Taking God and His dreams seriously requires serious strength. People around you may not understand – they probably won’t understand. In the midst of questions, be strong. Remember what God spoke to you weeks, months or even years ago. Day in and day out, Solomon got up and worked on the Temple. He met with crews. He observed progress. He made changes. Dreams require hard work. He “dug ditches”. This is where the rubber meets the road. It’s the ditch digging of building a dream. It is not glamorous, but it’s vital to accomplishing a goal. If you want to see the dream come to pass, do the work. Imagine that scene. A dream project complete after seven years of construction and decades of planning. The band strikes a song, and God Himself enters the building. This is our goal. God entering into our completed dream, making it truly complete. Have you left room in your dream for God’s glory? Dreaming impossible dreams means lots of hard work, moments of confusion and questions of calling. Be encouraged! This is a sign you’re on the right track. I would love to hear your thoughts. What area do you struggle with? How do you overcome?